We add two more entries in our “en face” collection. This is one of the most popular series, especially for learning one of its representative forms. After all, you get the text in Chinese AND in English, and then a self-contained VCD (in Chinese, with English subtitles) to watch the performance and check your own. Here we have a new “combination” Round Body Bagua used in competition in China.� Also we have Guang Zhong Boxing, rare in the West, which is� possibly one of the original forms that pre-dated and became the foundation for Northern Hong boxing, one of the strongest Long Arm styles we have seen in along time. Posted May 16, 2014 by Plum Staff. Comments and trackbacks are open. Follow the comments feed. 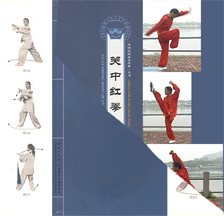 Tagged with: chinese martial arts books, guang zhong boxing, hong quan, On Bagua Zhang, pakua chang, round body bagua zhang.